Tampa, Florida is a trendy and intriguing city full of history and culture. Tampa is one of the most well known cities in Florida and boasts plenty of notable and entertaining places. Resting on a small peninsula that stretches out into a beautiful bay, Tampa often feels like a tropical paradise, but it actually features a subtropical climate. This type of climate is characterized by humidity, and Tampa gets a lot of it with its hot summer days and frequent, heavy thunderstorms. With high average temperatures year round and an abundance of rainfall during the distinct wet season, the constant presence of heat and moisture in Tampa can be a major benefit for residents and visitors but a significant downside for living and working structures. Though Tampa is a lovely place for people, it is not always a lovely place for buildings as its environmental conditions can cause foundational problems, sinkholes, and seawall erosion. Therefore, Solid Foundations offers its professional foundation repair, sinkhole remediation, and seawall repair services to Tampa, Florida. The wind, water, and weather overall can be intense in Tampa, Florida. Therefore, the foundation of your home or business needs to be able to endure an excess of stress in order to preserve your family and your property. High temperatures and humidity levels can trigger problems such as mold, musty smells, insect infestations, buckled hardwood flooring, and condensation on pipes and insulation. Heavy rains can position pools of water around your home that put hydrostatic pressure on your foundation. This type of pressure can open up voids beneath your foundation that create cracks in your slabs or foundation. Plumbing leaks can also create these voids. Extended dry periods can incite the soil around your foundation to shrink away and leave your foundation lacking support, and this occurrence can force your foundation to sink or settle. In order to prevent complete foundation failure, contact the Tampa foundation repair professionals of Solid Foundations at the first sign of any trouble with your foundation. Other signs include doors, cabinets, and windows that stick and will not close properly; stairways pulling away from the foundation; leaning chimneys; and even leaning homes. If you notice any of these signs in and around your house, then you know it is time to call Solid Foundations for our Tampa foundation repairs. Our Prime Resins® polyurethane resins and grouts are of the highest quality, and our Grip-Tite® piering systems come with a lifetime transferrable warranty. These sturdy tools lift, level, and support your Tampa home or business so that you are no longer dependent upon the soluble and shaky limestone for full support. The soil beneath your home is your second foundation, but because it can settle and give way, you need the quality foundation fix that only Solid Foundations can supply, so depend on Solid Foundations for your foundation repair in Tampa, Florida. While sinkholes happen all around the country and all across the world, Florida has a reputation for being the center for sinkhole activity. Florida has more recorded sinkholes than any other state in America, and the northwest region of Florida is the primary location for most of these sinkholes. As is the case throughout much of Florida, the geological foundation of the Tampa area is porous limestone that can easily be corroded by the acidic rain that falls from the sky and increases in acidity as it moves through decaying organic matter in the ground. As the acidic groundwater flows beneath the limestone bedrock, it wears away the lower layers of the limestone until only thin upper layers covered in soil remain. Any amount of weight applied to these upper layers can result in their collapse and the creation of a sinkhole. Sadly, Tampa is in one of the three counties that comprise Sinkhole Alley. Hillsborough County, which houses Tampa, Florida, joins Pasco County and Hernando County to make up the area in which approximately two-thirds of all insurance claims related to sinkholes have been reported in recent years. It is actually believed that the steady population growth in this region is contributing to the occurrence of sinkholes, as land that is being developed now was the site for sinkholes years ago. The continuing development of this land can induce sinkholes through the changes in drainage patterns and groundwater levels that this development effects as well as the heavy traffic and drilling vibrations it produces. These indications of sinkhole activity should get an immediate reaction from Tampa area homes and businesses, and that reaction should lead you to call Solid Foundations. Solid Foundations is here to inspect your situation and solve your Tampa sinkhole problems. We have the geotechnical knowledge and the lengthy experience needed to fix your sinkhole properly the first time with our cement grouting solutions. These solutions include compaction grouting, by which Solid Foundations adds a thick mixture of cement and grout to the deep layers of soil in order to increase the load bearing capacity of the soil. This mixture maximizes the density of the soil by permeating the voids, filling the holes, and sealing the limestone in order to prevent any pending damage from sinkholes. Another guaranteed solution to sinkhole issues that Solid Foundations offers is void filling, our process of lifting and fixing any concrete slabs that could be affected by a sinkhole. To restore the safety of your slabs, Solid Foundations pushes a high strength structural polyurethane foam beneath the slabs in order to flood the empty spaces and leave the concrete extremely strong and sturdy. These tried and tested Tampa sinkhole repair techniques enable the people to Tampa, Florida, to feel comfortable and secure in their homes and businesses. Bays and waterways flank the city of Tampa. Old Tampa Bay and Hillsborough Bay are situated on either side of Tampa, and these two bays come together to form Tampa Bay. Hillsborough River runs through downtown Tampa, while Palm River flows around the east side of the city. These bodies of water, as well as many smaller inlets, lakes, and ponds that dot the Tampa landscape, provide many families and business with the opportunity to enjoy the luxuries of waterfront property. However, these sources of water also pose threats to the seawalls that protect waterfront properties from flooding. Residences lining the rivers and bays depend upon seawalls to keep their homes safe and dry, but the constant battering of the waves, wind, salt, debris, and other elements can cause seawalls to deteriorate and jeopardize the people they were designed to preserve. The pressures of their environment can cause seawalls in Tampa, Florida, to crack, sink, rotate, or bulge, and if these issues are not attended, they can lead to the total failure of the seawall. However, locals have nothing to fear when they trust Solid Foundations for their Tampa seawall repair. Using our Targeted Grout Injection, Solid Foundations can plug the leaks and penetrate the underground voids that could harm your seawall. The hydrophobic grouts we use in our Targeted Grout Injection process are able to fill holes, repair leaks, and stabilize soils in the wet areas around seawalls due to their low viscosity, high expansion rates, and ability to cure in water without diluting. This type of resin forms a solid, waterproof mass that stops underground water flow and deactivates seawall leaks all while eliminating the need for any excavation and for any disturbance of nature. Solid Foundations has years of experience supplying seawall repairs to Tampa, Florida, so we are always available to help the citizens of this beautiful area recover from any problems with their seawalls. Solid Foundations is here to provide our expert foundation repair, sinkhole remediation, and seawall repair to the residents of Tampa, Florida. For other structural complications Tampa residents may experience, Solid Foundations offers crawl space repair, slab lifting and leveling, void filling, pipe and structure leak repair, soil stabilization, and French drain installations. 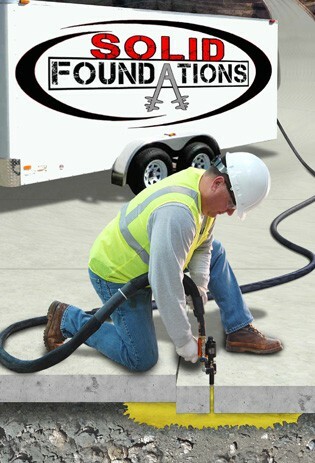 No matter your foundation problem in Tampa, Florida, Solid Foundations has the fix you need. Contact us today for your Tampa foundation repair services!